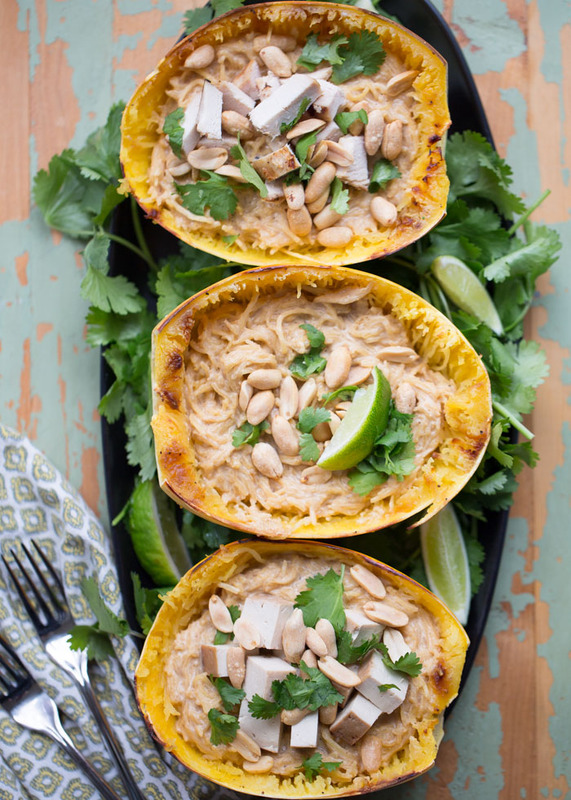 Thai-inspired peanut sauce tossed with spaghetti squash and topped with crunchy peanuts and cilantro. Top individual servings with tofu for the vegans/vegetarians or chicken for the carnivorously inclined. I love a simple spaghetti squash recipe. I mean, there’s not much better than roasted spaghetti squash mixed with a bit of olive oil, coarse salt, and a heavy dose of freshly ground black pepper. In fact, this recipe was going to be something like that at first – I’ve been loving on the spaghetti squash + black pepper combo for awhile now, and so I thought I’d share it as an easy side. And then I realized it wasn’t exactly a blog-worthy recipe … if you could even call that a recipe. Roast your spaghetti squash, toss with olive oil, salt, and pepper, the end. But, you know … I didn’t want to up it too much. Because there’s a time and a place (often/most everywhere) for simple. 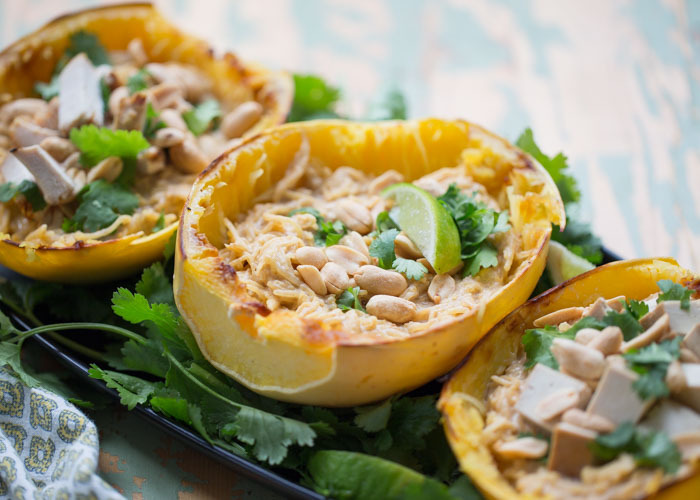 And this recipe for Thai Peanut Spaghetti Squash Boats definitely qualifies. So here’s what we’ve got. 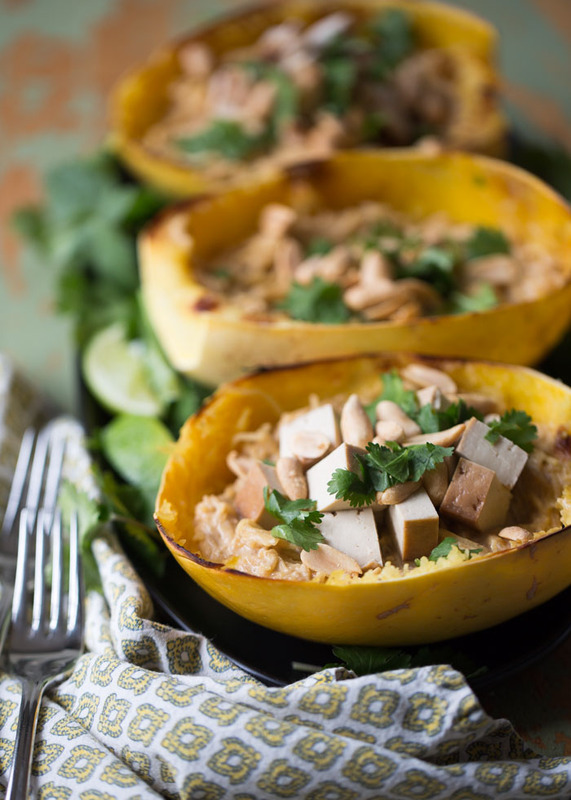 Oven-roasted spaghetti squash (you can use your microwave to save time if you like), tossed with the simplest Thai-inspired peanut sauce. Then we scoop it back into the spaghetti squash shells because spaghetti squash boats = fun. Top those bad boys with peanuts, cilantro, and – if you like – some protein of choice. 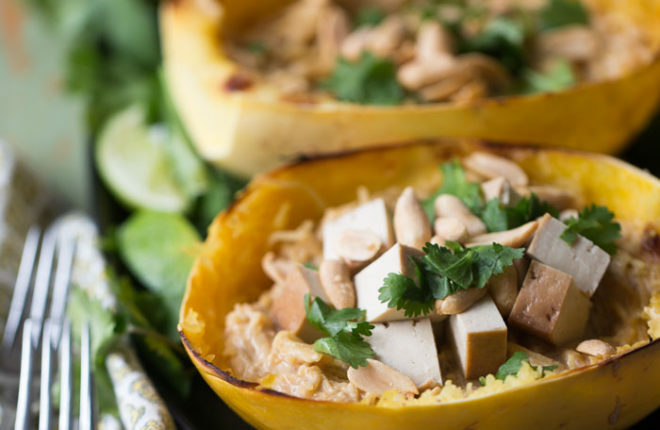 This unbelievably easy spaghetti squash dish is so rich and creamy, with garlic-and-ginger-tinged peanut sauce + crunchy peanuts + a bit of fresh flavor from the cilantro. It makes a great side, but also serves as a perfectly satiating main course. We also love this one as a one-dish-two-ways situation – it’s super versatile. It’s vegan as-is, or you can add some of your favorite cooked-and-cubed tofu for a bit of added heft (and it’s still vegan!). For the meat-eaters in the house, either top with or stir in some cooked and chopped chicken. Wash outside of spaghetti squash. Cut off the stem end, then cut in half lengthwise. Scoop out the seeds. Brush insides with olive oil and sprinkle with 1/2 teaspoon salt and 1/4 teaspoon black pepper. Place face down on a baking sheet. Bake until fork-tender, 30-40 minutes. Remove from oven and let cool for just a couple of minutes. Alternative: Cut in half, skip the oil/salt/pepper, and place face-down in a microwave-safe baking dish. Fill with about 1 inch of water and cook on high until tender, 10-12 minutes. Read lots more about cooking spaghetti squash both ways right here! While the spaghetti squash cooks, make the peanut sauce and prepare the toppings. To make the peanut sauce, add the peanut butter, 1/4 cup warm water, ginger, garlic, lime juice, and Tamari to the pitcher of a blender. If you have a high-speed blender, you might not need to mince your ginger and garlic first – I don’t need to with my Vitamix, it takes care of business! Add additional water, if needed, to keep the mix moving. Blend until completely pureed. Using a fork, carefully scrape the still-hot spaghetti squash out of its shell into a medium-size bowl, taking care to not break the shell. Place the shells upright on your serving plates or platter. 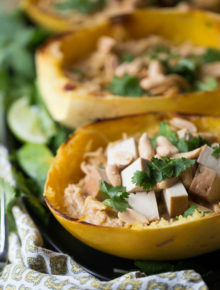 Pour the peanut sauce over the warm spaghetti squash and toss until combined. Taste and add a couple extra pinches of salt if desired. 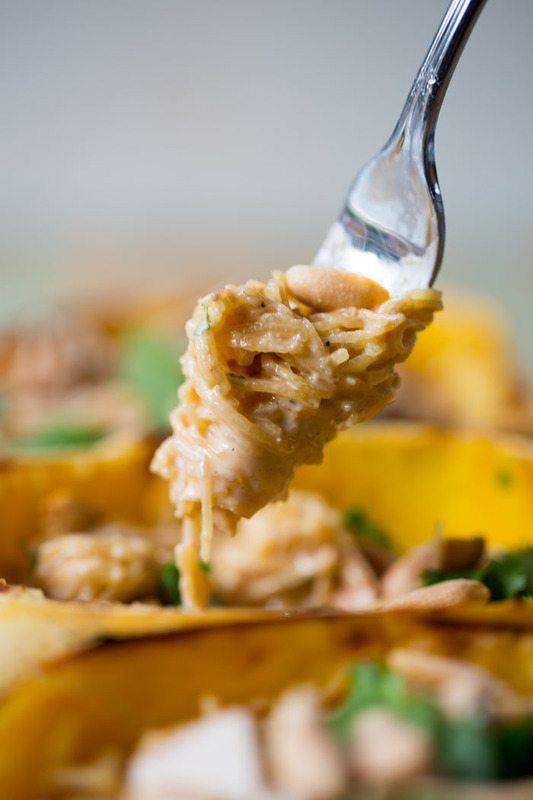 Divide peanut-sauce-spaghetti squash mixture between the shells. Top with peanuts, cilantros, and wedges of lime to squeeze over the top. In addition, you can top individual servings with tofu or chicken if you like. Note that if you’re not serving this right away, you may want to warm the peanut sauce on the stove so that it’s piping hot before mixing it with the spaghetti squash. I find that as long as I mix the peanut sauce into the hot spaghetti squash and serve it at once, it’s plenty warm for eating. Top with cooked, cubed chicken (warmed if you like). * Soy sauce is not gluten-free, but Tamari is. Weight Watchers Smart Points: 13 SP per serving (1/4 of recipe) – this is without any additional protein (chicken or tofu). Nutrition information is for the version without any added tofu or chicken. I tried this out this week and it was pretty tasty! The sauce was spot on for that pad-Thai flavor. I’m still trying to get used to spaghetti squash but this is my fav version so far! I made my squshbin the instant pot just to move things along. Will definitely make again. Hi Amanda, I’m so glad you liked it. It’s one of my favorite new ways to eat spaghetti squash!